VIP Package Includes a drive through Pit lane garage + Spectator Pass + Passenger Band + Roll Racing entry + Support Vehicle pass . Your garage number will be given to you when you sign in at the venue, if you would like to request a garage beside your mate then you will need to contact us 2 DAYS prior to the event. Roll Racing Entrant, Transfer of ownership Transfer of ownership fee is payable when you need to transfer the entry ticket out of your name and into someone else’s name due to the administration involved to do so. We will also be able to capture all the information required to speed up the accreditation process and gives the new person the opportunity to purchase the RACERS licence they require. No transfers, cancellations or credits after 12 Midday on the Wednesday prior to the event. All paperwork is processed at this point and can’t be changed. We don’t offer refunds on Roll Racing events. Spectators can also take part in the event by signing a waiver and purchasing a passenger band $20 from the drivers briefing area and they can ride shot gun to see what the fun is all about. Passengers need to be wearing the same safety gear as the driver – Helmet, neck to wrist to ankle non-flammable clothing and enclosed shoes. All arms and legs are to be kept inside the car at all times and failure to follow these rules with remove your passenger privileges. EVENT RULES & REGULATIONS – NON ALCOHOL EVENT Roll Racing events are open to all types of road registered cars. Unregistered cars are also welcome but need to be approved by Roll Racing management and must be pre entered. We have V8’s, Rotors, 6 Cyl and 4 bangers, GTR’s, XR6 turbos, old school Aussie muscle and American Muscle Exotics and everything in between, full race cars like Time Attack cars and circuit cars are also welcome but again Roll Racing management will need to approve them prior to the event. If you have a show/exotic/special interest car which you don’t want to leave in the car park then you can get a paddock pass by contacting us prior to the event to arrange this and then we will let you park in the paddock area but we will have your details and ability to contact you if you are in the way. All drivers must be a minimum of 18 years of age. Entered vehicles must be road registered, we do accept unregistered vehicles but they need to be approved prior to the event by Roll Racing Australia. Your vehicle, current drivers & license must be presented at the Accreditation Office. It is still the responsibility of the owner of the vehicle to ensure that the vehicle is adequately prepared for the event. This includes but is not limited to steering, brakes, "especially pads and fluid" and brake lights, battery clamps and all other safety equipment fitted including seat belts windows etc all shall be in excellent working order. Roll Racing is an alcohol free event the only acceptable blood alcohol reading for entrants is 0.00. Random breath testing will take place throughout the event. Entrants are required to wear helmets, enclosed footwear and non-flammable clothing with full coverage from ankle to wrist to neck. All Entrants/Participants are required to follow all Roll Racing Australia Staff and/or Official’s directions promptly and to full compliance. 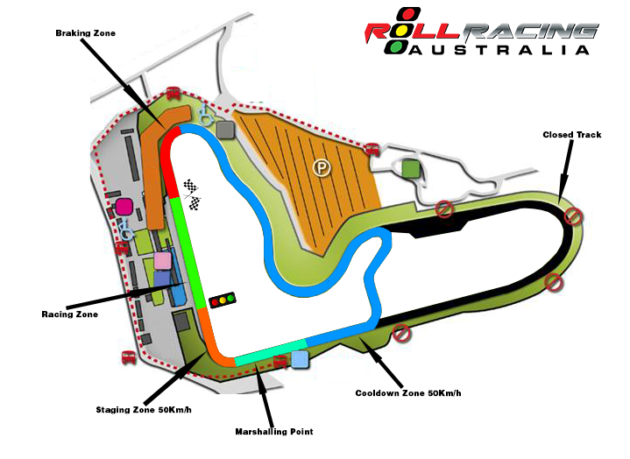 All Entrants/Drivers/Vehicles are accepted at the discretion of Roll Racing Australia. The promoter has the right to terminate my participation in the event at any stage for whatever reason he and/or she sees fit. Entrants must take responsibility for their actions and there will be no exchanges or refunds. No transfers, cancelations or credits after 12 Midday on the Wednesday prior to the event. All paperwork is processed at this point and can’t be changed. We don’t offer refunds on Roll Racing events.